In front of my meditation window is a beautiful honeylocust tree. I have been witnessing it for 2 years. 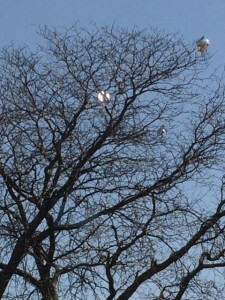 One day, a week or so ago, I saw that a mylar balloon was stuck in the highest branches. I was very annoyed. Then, I noticed my mind being annoyed. I let the feeling come and go like a wave. Why should I let such a little thing disturb my peace of mind? The neighbors whose tree it is have moved and my ladder will not reach the deflated balloon to remove it. I congratulated myself for coming to a sense of peace. Last night, a family went on top of the sledding hill – a set of 10 mylar balloons in hand and boisterous, happy children. Now, there are 4 mylar balloons stuck in the honeylocust tree’s branches. I had to laugh. Hubris. Perhaps one day soon a practical answer will arise: how to serve this old tree and remove the glittering litter. But it sure teaches me something about the perfectionist nature of my own mind. Do all conditions have to be perfect for me to be at peace?